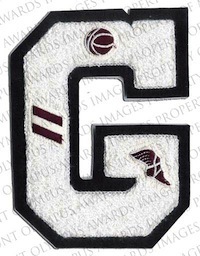 If you are an individual who wishes to purchase custom chenille letters, patches, or other letterman jacket and varsity jacket awards, you can do that at our Mount Olympus Awards site (there are no minimums for individuals ordering there). This is our wholesale site, MOA Team Supply, which offers huge quantity discounts for schools, corporations, organizations, and teams. Our wholesale site does require minimum quantities. Would you like us to attach this to another product you are ordering such as a varsity letter or sports patch? If so, tell us which one in the text box. Otherwise, the insert will ship unattached. Another idea is to mix and match swiss inserts with sports pins (sometimes called letter pins in certain parts of the country). These can be added to any existing letter with ease by simply pushing it through the material and attaching the included pin on the backside. We offer a variety of sports pins and mascot letter pins, almost all of which come in a beautiful gold color or deep bronze color. As with virtually all of the products at MOA Team Supply, there are low minimums on these embroidered swiss inserts. You can design and purchase only a handful or thousands depending on your needs. If you have questions, or need assistance in designing the perfect insert for your patch, varsity letter, or other product, contact us and we'll be happy to answer your questions or walk you through the process. Each embroidered swiss insert measures approximately 1 inch in size. There are low minimums on our custom swiss insert, sports pins, or varsity letter products! If you are ordering your sports patches, varsity letters, or other products from us, you can have us attach these embroidered swiss inserts or ship them loose. There is no extra charge if you want us to attach them to a product you are ordering from us. We allow you to choose among thousands of potential color combinations when designing your embroidered swiss insert. In an effort to support the United States, we have made a decision to sell only high quality embroidered swiss inserts manufactured with pride by American workers in American chenille and embroidery factories. Some of our competitors utilize offshore labor and then attempt to pass the imported award letters off as comparable quality. That's not how we want to do business. Thanks to our unique low-cost business model, our factories are often able to beat their prices despite paying above-average wages to production workers. As with all custom swiss inserts, these products are dry-clean only. Never wash them in a traditional washing machine.